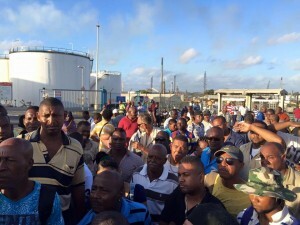 WILLEMSTAD – The actions of the oil refinery contract workers will continue today. This is according to the leader of their union SGTK, Alcides Cova. Cova made this announcement yesterday after a meeting with the Minister of Social Development, Labor and Welfare, Ruthmilda Larmonie-Cicilia. In the meeting, both parties discussed the situation of the refinery employees and their fight for a raise in their salary. According to Cova, during the meeting, it became known that Venezuela, which operates the refinery, is refusing to put more funds available for the salary increase. “I understood that Venezuela is said that they will not support an increase in salary. I do not know what their reasons are. We have asked for funds to compensate some things here, but Venezuela said no,” said Cova to the employees. According to Cova, this means that the employees will remain without the extra compensation. This morning all the unions on the island will meet with the SGTK to discuss how they will continue. “The unions will form an alliance to help SGTK. In the meeting they will also discuss what other options they have to intensify their actions,” said Cova.